C – R – U – S – A –D – E – R –S! 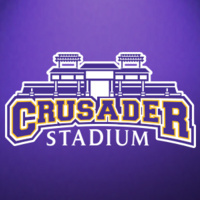 Your Cru Kid will get to spend time on the field of Crusader Stadium with Crunk, the UMHB mascot and hangout with the UMHB football team and members of UMHB Cru Cheer and the Sader Belles. This special event is part of our Homecoming festivities, and is the only opportunity that kids get to experience Crusader Stadium as our team does. Each of our Cru Kids will get special temporary tattoos, footballs, and pom-poms to help their Cru Spirit, and this is the perfect photo op for parents to get that TRUE CRU photo. This event is for Cru Kids, who are registered with the Alumni Association. To register for Cru Kids, visit go.umhb.edu/alumni/cru-kids or call 254-295-4599.